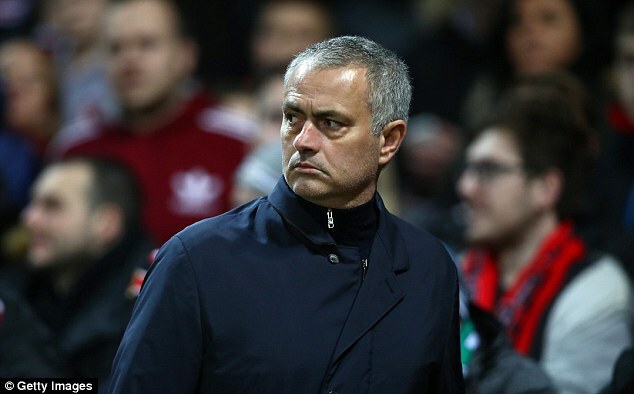 Jose Mourinho hasn’t been far from the headlines all season, his first in charge of England’s biggest club Manchester United. 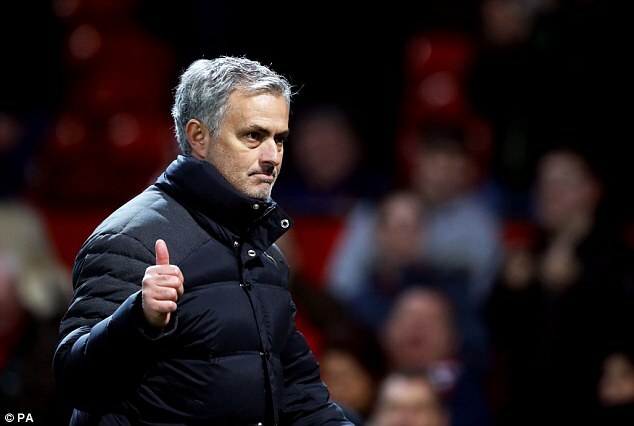 In a detailed and enlightening interview with his friend Nuno Luz of Portuguese television channel SIC that was broadcast in his homeland last week, Mourinho spoke openly about his work and career in Manchester. 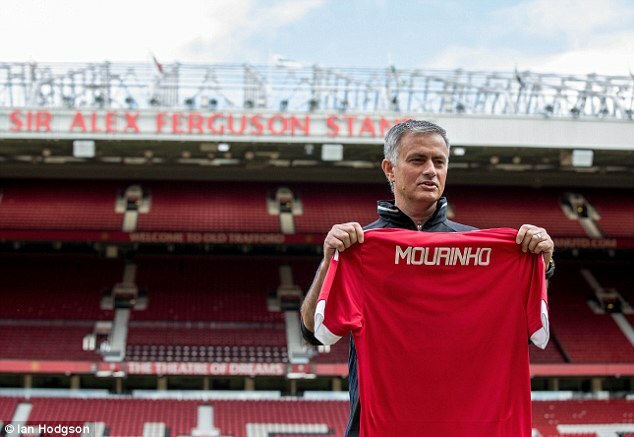 Here are extracts from the half-hour programme.. Mourinho in his own words. Manchester United play Middlesbrough Sunday with one trophy in the bag and a top-four finish and Europa League silverware still to fight for. I think the club got so used to winning and having success, maybe they didn’t realise other clubs were growing, even when Sir Alex was in his last years at the club. The Premier League were creating conditions for the other clubs to become financially powerful and that has definitely transformed the league. When I first arrived at Chelsea, I wanted to buy Manchester City best player (Shaun Wright-Phillips) and I did. Manchester United wanted Tottenham’s best player Michael Carrick, and they did. Later they wanted Arsenal’s best Robin van Persie. And so on. Nowadays all clubs have grown and with TV rights being shared, it’s almost unique in European football. 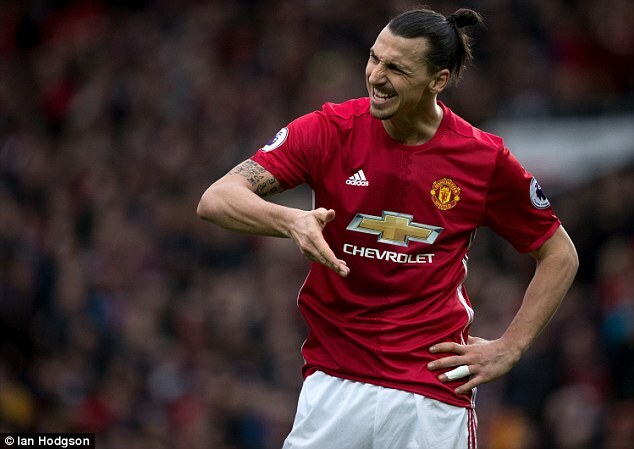 It has allowed that difference in power to be slowly diluted, in a way that Manchester United stopped being the all-powerful Manchester United, and became part of a group of five, six, seven very powerful clubs. They are followed by other clubs, less powerful, but not poor clubs. United had a bit of everything happening at the same time. The exit of Sir Alex, unique and more than just a manager, the change of powers in the Premier League and a period of instability at Old Trafford; three managers in three years if you count Ryan Giggs. 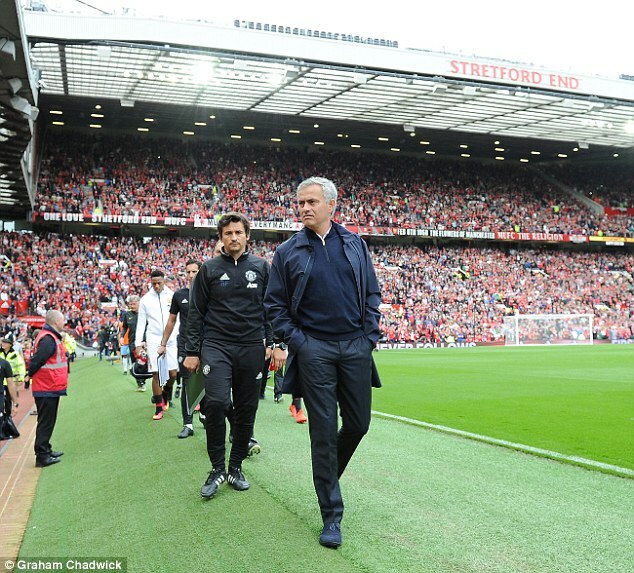 It was a period of some instability, disbelief and even distance with the fans. 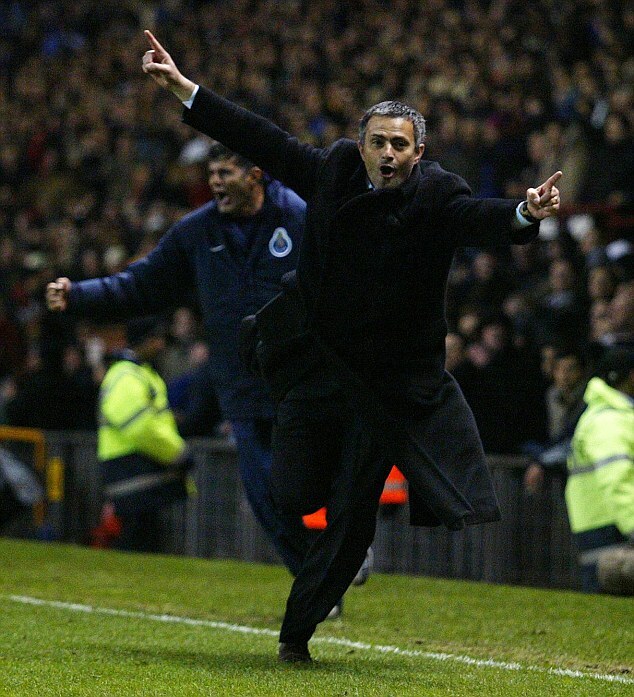 One moment I’m at Porto scoring in the last minute at Old Trafford, a team of kids coached by a kid, realising a dream. Thirteen years later, I react differently but still go home upset with a defeat and wanting to understand and analyze, and wanting to play again, and win. I still have that feeling, almost like a personal revolt, when things go wrong. But I’m still a very happy man, capable of being emotional with a special victory. In that aspect I continue to be the same but I also understand with experience that I continue to be looked at with different eyes. I was banned from entering a stadium, where my team was playing, not even with a purchased ticket. 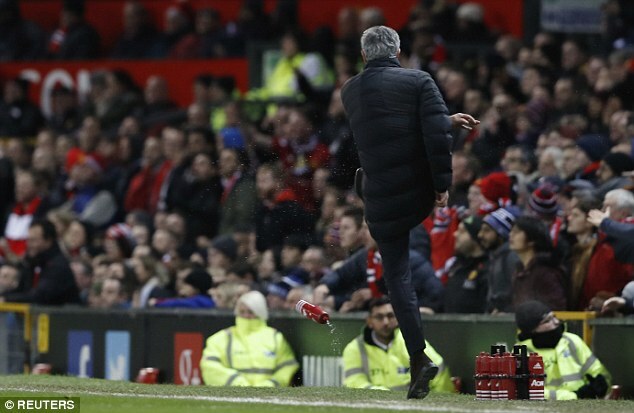 This year I was sent off for kicking a plastic bottle, another coach for pushing a ref (Arsene Wenger), nothing happens. I started to understand that there are powers that you cannot fight against. This is also a life lesson, an unfair lesson, but nevertheless a life lesson. When I was an assistant-coach, one boss in particular used to tell me to go on the coach and check if any players were on the phone, I’d spot players with heads down hiding their phones, and I would return to my boss and say, no stress, all good, no one on the cell phones, I understood there are things where there is no way back. I try to establishing a few basic rules, for example a player that’s injured can not put his diagnosis on social media before the club. But it’s impossible to say ‘If this were back in my time’. It was once impossible to take a picture inside the changing rooms after a victory. You’re right, back 20 years ago. So there are things that you can’t fight against. In my case I have Instagram, as my commercial partners felt it was good. Once a month, or on the King’s birthday I might put up a funny picture, or something people who follow me might like. At my age that I can also learn a lot from the kids that I work with, that with kids. I have a ‘messy’ organized table in one area where I work. Watch videos, talk with a player or a coach. There is another space where I like to be alone. I have a bike (exercise bike, in front of his desk) just to fool people, it’s just there for decoration. I only pedal when I’m happy, when we win. When we don’t win, I don’t pedal. I have a privileged view to all the pitches. I like to keep to the same structures and the same assistants, and give confidence to the people that are here for many years, I like to teach them how I work, that doesn’t mean that it’s the correct way, but teach how I like people to work, always giving the possibility to adapt. It’s important to bring in my people, people that identify themselves with me, who know my work perfectly and help to speed up processes. 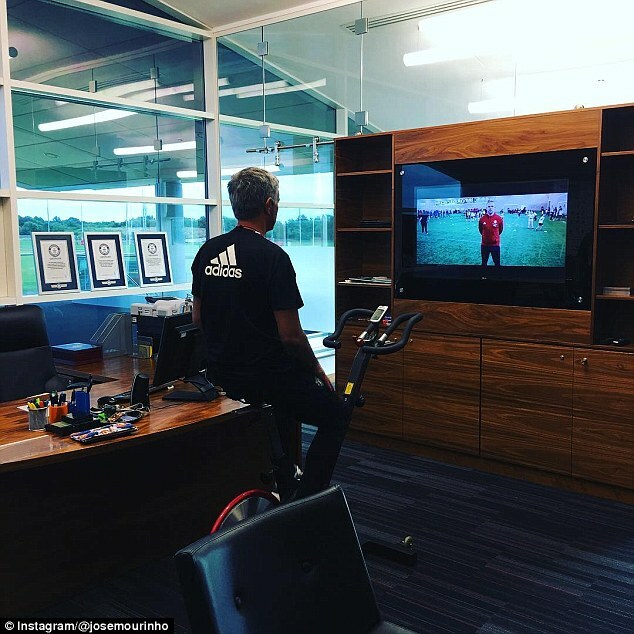 If I need to be in a meeting for a reason and unable to be in total control, Rui (assistant-manager Rui Faria) has a level of experience, and also knowledge of how I think. Rui is a fantastic coach, that has never been first team manager, but with great capabilities. All have very good ability, we have a structure that can work with their eyes closed. My assistants all live in the same building, and their building is two minutes away from the hotel where I’m staying. We have dinner together, pretty much everyday. 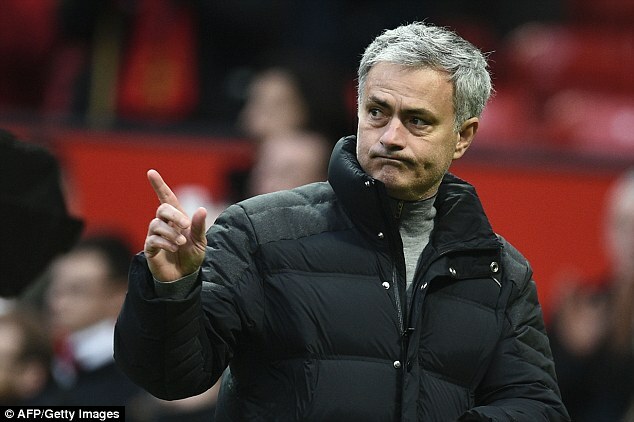 Because we are without our families, it makes us partners everyday, 24 hours a day (Goalkeeping coach Silvino Loura says that if Mourinho goes to an assistant’s house for dinner, he is happy help out by setting the table and cutting the cheese). I came (to United) knowing the work ahead was difficult with some not-so-good moments. 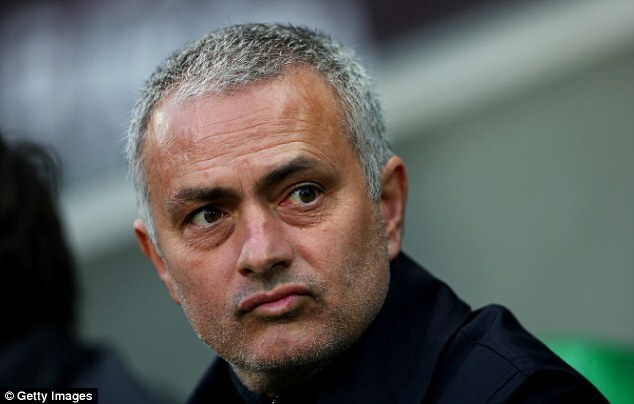 But I had a tranquility, security and stability, so going 18 games unbeaten (in Premier League) would not send me to the moon, but in the same way that five or six consecutive draws would not leave me in a difficult situation. I’m in a very good moment, as a manager, as a person to face a hard job I have on my hands. In the morning, normally Ricardo Formosino (who scouts the opposition), comes and meets up with me around 8.30am. The training session is at 11am, if we train once on the day we leave around 4pm, if we train twice, around 6 or 7pm, it’s how we are, and the job is not just training, it’s much more than the sessions. We go back to Manchester at the end of the day. London is very close to Manchester by train, with direct trains, every hour. One hour, 45 minutes and I’m home. It could also happen if there is no training in the afternoon, I can go home by train, have dinner, sleep and return the next morning. Or after a match go to London. It’s not the same situation as being in different countries or miles and miles away. I am polite if I meet people (on the train). I also ask people for a bit of co-operation. If I tell people ‘at the end’, they respect that. I do my journey relaxed; resting, reading or watching a game on an iPad or working, responding to emails. When I get to London, I leave the train, wait for the people. Five minutes, half-a-dozen pictures and autographs, and bye see you soon. One day, after a period of a few bad results, he comes up with some analysis, obviously suffering because Dad wasn’t doing well, we had lost to Watford and Man City I think. And he came with the stats of the team, I showed them to my assistants and I told them, be careful as one day this boy will take one of your places. I compare him with me at his age, where I would try do the same sort of things for my dad, of course with different technology methods, but analysis from a kid now aged 17, but 16 then. We had a bit of work to do here, because there was no planning [spatial planning], we had to do the planning. We organised two pitches like Old Trafford, with exactly the same dimensions and same grass. We made two (other) pitches with what’s called ‘Tesso’ that’s used lot in England due to the climate, it’s a mixture with a low percentage of synthetic turf and then natural grass, which we find in a lot of the premier league pitches away from home. There is a space we call the Silvino Louro Stadium because it’s where the goalkeepers train when they are doing specific work and away from the rest of the group. We built all these fences and nets, so the balls won’t go astray. The floodlights were also important, the pitches were not lit, at times we like to train in the afternoon and there are days where obviously at 3pm it’s impossible to work. We’ve tried to improve and modernise the working conditions even more. As you know, a club can be giant like this one, but if you stop for a couple of years, it’s complicated. I had experiences of bad home results, as we drew some games against teams that in theory we had the obligation to beat. We drew games enjoying 70% possession. We beat the Premier League record of most shots on goal against Burnley and drew 0-0 and even playing with 10 men, and the team leaves -and the people leaving happy. And the song that they dedicate me, in contrast to other clubs where the chants were related to my name or special one, or the Portuguese one, here it’s something where they are feeling good and are happy with the way I am leading them. To win the league this season is obviously mission impossible, the distance is more than considerable, but there is this feeling, where the people is happy, were the people like it and believe in the future. We have the same friendship we always have had, an SMS, a birthday or Christmas card. He wanted to leave and not return, maybe for his own comfort. 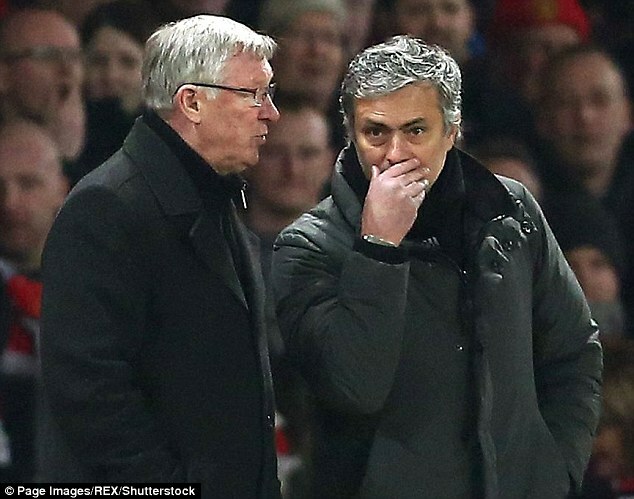 I told him, it made no sense, us travelling to London on a private train and Sir Alex, going by car. ‘No, you come in the train’. He’s so respectful that he got a bit shy in this approach, it has to be us to make him feel cared for, and made him feel that in our heads there aren’t ghosts. He will always ben an ambassador to this club but he’s been doing it as far as he can from the changing rooms. 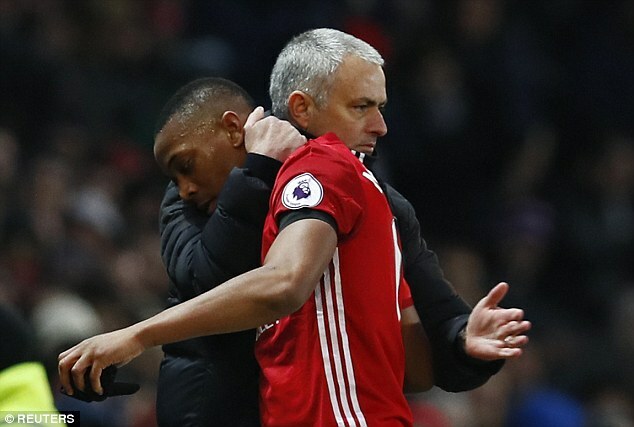 At the end of games, when he, Sir Bobby Charlton and the CEO come down and he’s the only one that doesn’t come in the changing rooms, I told him this type of situation makes no sense, he needs to feel free to do what a person of his stature that represents the club can do. Three years (minimum), I think I will be here, I think the club understood the necessity to give stability to all levels. I believe if we do that, even without a massive success, which is harder in football, even more so in England, but with some type of success, I see myself staying here if they want me to stay. If they want me to stay I will stay, but like I say, we both need to be happy. I’m not a type of person to be at a club 10, 15 years, without real success. I need to have true success, my life is like that, I need that pride and happiness. In all honesty, I would like things to go well and be here many years.